Below is a quick guide to the Dengie products that can be used to replace or supplement your hay and haylage rations, limited turnout time or poor grazing. Hi-Fi Senior – suitable for a wide range of horses and ponies not just veterans! Combining high-temperature dried grasses and alfalfa, Hi-Fi Senior has been formulated to be soft and easy to chew. As both the grasses and alfalfa have been high temperature dried, this is a very ‘clean’ forage source making it especially beneficial for performance horses or those that have respiratory problems. Hi-Fi Senior is also very palatable so is ideal for horses and ponies that can be just that bit fussy! A tasty blend of nutritious chopped and pelleted alfalfa with high-quality soft straw. The inclusion of mint and fenugreek makes this a tasty option for those that are fussy. 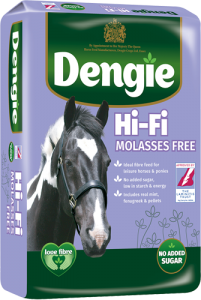 Hi-Fi Molasses Free contains no added sugar and provides only 2% sugar which is naturally occurring in the forage. 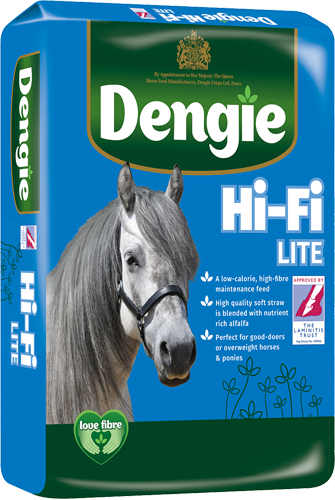 Hi-Fi Lite – the perfect low-calorie forage replacer! Hi-Fi Lite combines alfalfa and high-quality soft oat straw with a light molasses coating. It contains on average only 7% sugar, which is less than what you would find in average hay. 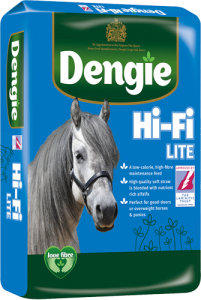 As Hi-Fi Lite is so low in sugar it is particularly suitable for horses and ponies that require a low sugar ration and those prone to laminitis. Hi-Fi Good Do-er – the lowest calorie forage replacer! Hi-Fi Good Do-er combines high quality straw and alfalfa with a molasses coating, spearmint oil and added vitamins and minerals. Hi-Fi Good Do-er is the lowest calorie product in the Dengie range and is therefore ideal for any horses or ponies that hold their weight particularly well, or are overweight. The added vitamins and minerals in Hi-Fi Good Do-er mean that when fed at the recommended quantity no additional vitamin and mineral supplement is necessary. 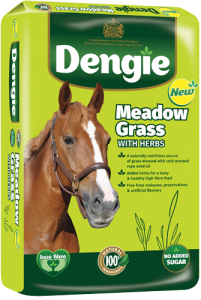 Meadow Grass with Herbs – bring your grazing into the stable! Lincolnshire’s finest, soft and sweet meadow grasses are dried, chopped and lightly dressed with cold-pressed rapeseed oil. Topped with a unique blend of herbs including liquorice root, fennel, mint, chamomile and aniseed to tempt the fussiest of eaters. How do I feed a Dengie hay replacer? To feed a Dengie forage replacer you would simply replace your forage on a weight for weight basis. For example, if you usually feed your horse 5kg of hay in the stable you can replace it with 5kg of one of the Dengie forage replacer products most suited to your horse. As a guide 1 section of hay from a 20kg bale would weigh approximately 2kg. To replace this you would need to feed 2 Measuring Buckets of one of the Hi-Fi products or approximately 5-7 large round scoops. 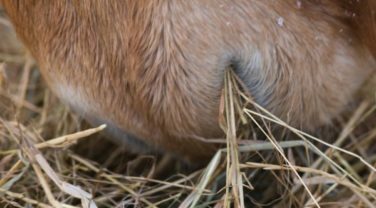 Unlike hay, the Dengie hay replacer products cannot be fed in a hay or haylage net. We would recommend leaving the desired quantity in a large bucket in the corner of the stable for your horse to munch on as required. If you find initially that your horse eats this too quickly then we would suggest using a large football or some very large smooth pebbles on top of the feed to help slow them down. For further information about feeding Dengie hay replacers please contact the Dengie Feedline* 0845 345 5115 or send us an e-mail.